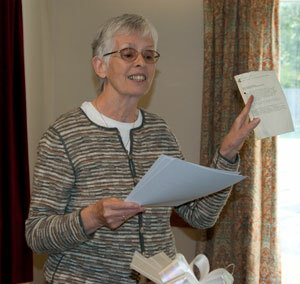 Sally Raven, Parish Council Clerk Retires after 36 years! Sally Raven has retired from office as Radley Parish Council Clerk after serving Radley for over 36 years, making her Radley’s longest serving Clerk! with a brief history of herself and Radley. Sally took over the office of Clerk from Mr C Northing on 1st April 1974 and has held it continuously since then. This means that she served Radley for 36 years and 2 months, making her Radley’s longest serving Clerk (surpassing the prior record holder, Mr W E Gall, who held office from 1925 to 1959). In that time she has served under seven separate chairmen and seen, indeed overseen, many changes in the Parish. In 1974, Peachcroft estate had not been developed and there were apparently few public amenities in the parish: the village hall, which was where the parish council met at the time, was just a wooden hut located near the Lower Radley mobile homes park. On the southern horizon, the gleaming spectacle of the new coal-fired power station at Didcot did not seem to have any special significance for Radley, and the Radley Lakes were a wilderness of active gravel extraction. The existing village hall, sports pavilion, play area and sports fields, allotments, bus shelters, the Church Room, the new cemetery and the community shop were all constructed or provided during Sally’s reign. And, of course, the saving of the last remaining Radley Lakes from infilling with power station ash was an exciting concluding chapter to a long and distinguished career. Before becoming Clerk, Sally already had considerable experience of Local Government, having worked full-time for Oxfordshire County Council for 17 years. Even after becoming Clerk, she continued in full-time employment in the Oxfordshire Health Authority, in the office of the administrator to the Department of Public Health Medicine (the equivalent of the Oxfordshire Primary Care Trust as now) until 1993, when she became the manager of the Medical Staffing Department at the John Radcliffe Hospital, and had dealings with hospitals throughout Oxfordshire until her retirement in May 2000. In 1982, there cannot have been too much going on in Radley, because in March that year she also took over the office of Clerk to Sunningwell Parish Council, an office which she held until September 1989. In 1985, Sally married Les Hemsworth but retained her maiden name of Raven in her many official capacities. Sally has already clocked up over 53 years of public service! Even now, she hopes to continue her role helping the Oxford Hospital Services charity, as well as retaining some links with Radley, such as through helping with the Parish Plan, and with compiling a history of the parish council. Sally says that she has thoroughly enjoyed what she has done throughout her life, but is now looking forward to a life relatively free of local government paperwork, and to opportunities for Les and herself to travel to interesting places whenever and for as long as they like. A celebration was held in her honour on Friday 28th May 2010 and was attended by over 40 current and previous councillors and parishioners. She was presented with a leaving gift donated by her friends and colleagues, a token of appreciation of her long and dedicated service, by Jenny Standen, the chairman of the Parish Council who warmly thanked Sally on behalf of the community and wished her well in the future. 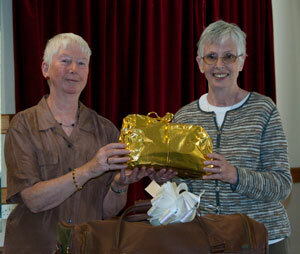 presenting Sally with a gift from parishioners and councillors, past and present. Mrs Jane Dymock has been appointed as the new Parish Clerk.